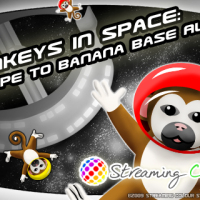 Monkeys are floating helplessly in space and they need help reaching Banana Base Alpha! Can you bring them home? 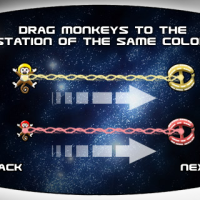 The objective in Monkeys in Space is to draw lines between a specific colored monkey and its corresponding space station. 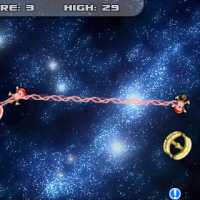 When the monkey reaches the space station, players gain a score. 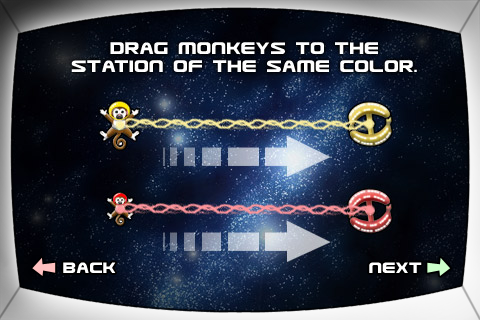 Chaining together monkeys of the same color and moving them to their space station gains extra score. 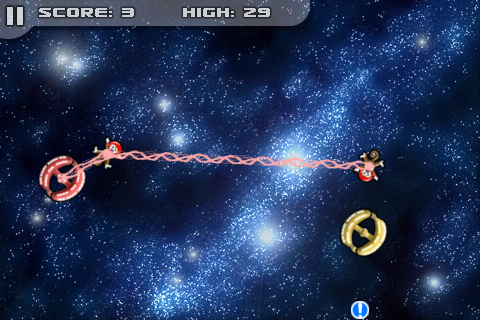 The game is a lot like the popular “Flight Control” app, where you navigate planes instead of monkeys to a destination. 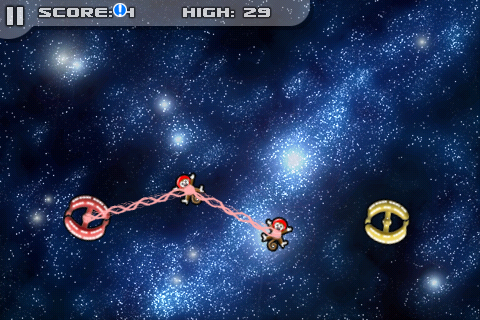 The only obstacle in this game is colliding monkeys together, which ends the round. 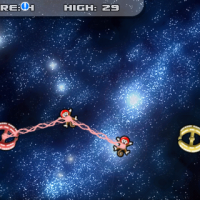 Monkeys in Space ships with three maps and the developer notes that there may be more maps coming in the future. I’m happy to hear that, since three maps is not a lot, but whether the maps will be free or paid is unknown. 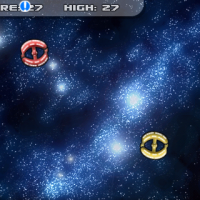 The game also has OpenFeint integration which means your score is tracked and added to your personal player profile that is transferable across any iPhone/iPod Touch game that includes OpenFeint support. Another great feature is the game auto-saves current progress in-case players quit the game or receive a phone call for example. You may check out a game play video here. Game controls are nice and simple using single or multiple finger gestures. 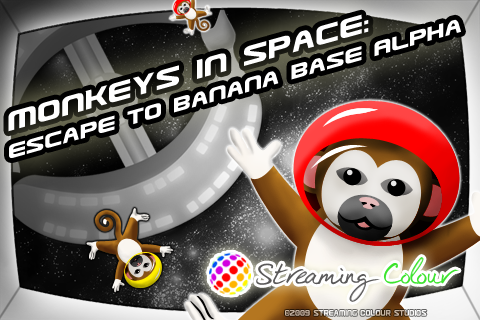 The play area is large which makes moving the monkeys to their space stations very clean and easy. Menu navigation is clean and includes a very helpful tutorial for those who want some instruction before beginning play. 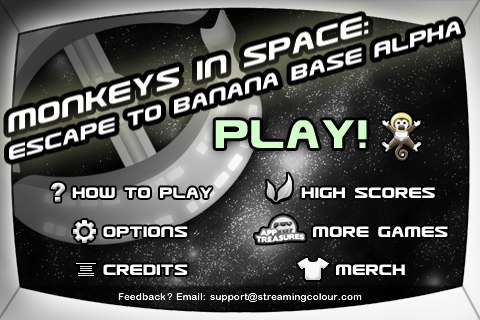 The opening menu also includes a link to an online merchandise store where users can purchase Monkey in Space swag. Definitely an odd menu item, but hey, whatever floats your boat. 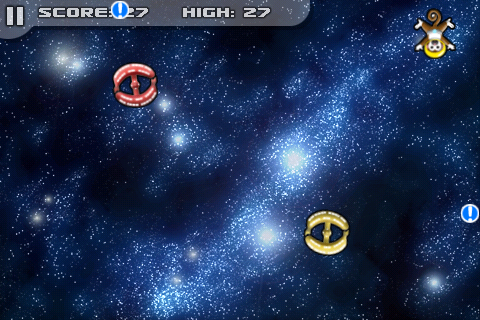 The game includes a custom soundtrack for players to enjoy but iPod music is also enabled. In other words, if the in-game soundtrack doesn’t do it for you, the iPod is the alternative. I was disappointed at the lack of sound effects outside of when receiving points. 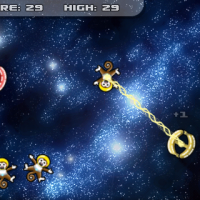 While this is not a big issue, some extra sounds when attaching the monkey to the space station would have been neat. 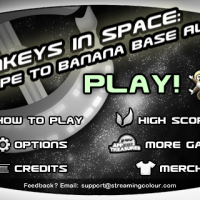 Monkeys in Space: Escape to Banana Base Alpha is scored a 3.5/5. 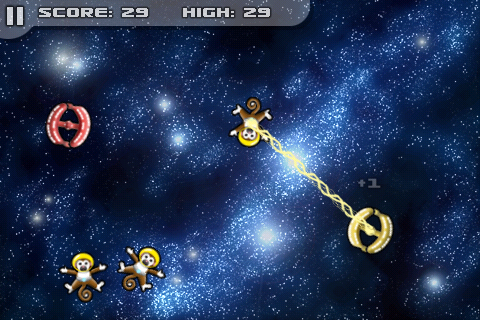 Monkeys in Space: Escape to Banana Base Alpha is available in the iTunes App Store for $0.99.